The issues outlined in our corporate responsibility (CR) strategy and framework are based on a rigorous materiality selection process, as described below, which ena bles us to identify the issues that matter most to our stakeholders and our Group. We have set medium-term action plans focusing on each of these material issues, and will be disclosing the progress and results of related activities on this website. Corporate governance* As a global company, maintaining strong corporate governance practices is of critical importance to LIXIL. It is also an issue that has become of increased interest to our shareholders with the adoption of Japan's Corporate Governance Code in 2015. While expanding our global reach, our corporate governance was put to test in 2015, when we discovered accounting irregularities at an overseas subsidiary. To prevent recurrence of such incident and solidify our operating foundation, we must further advance our efforts to strengthen our corporate governance, compliance, and risk management systems. Anti-corruption* Corruption is detrimental to the development of a sustainable society. Global scrutiny towards bribery and fraud is intensifying, and extraterritorial application of penalties is increasing rapidly. Human rights due diligence* With the UN's adoption of Guiding Principles on Business and Human Rights clarifying the responsibility of companies to uphold human rights, protecting and respecting human rights both within the LIXIL Group and across its entire sphere of business influence have become a greater priority. Diversity and equal opportunity* With global expansion, our business and organizational structure have become more complex and diverse. We therefore need to grasp and manage appropriately risks related to occupational health and safety across the Group. Diversity is vital to innovation. Companies worldwide are increasingly focused on attracting and retaining high-caliber employees. We are actively promoting diversity in line with the LIXIL Diversity Declaration, but we need to push ahead further in pursuing this cause. Product safety* Product safety is a top priority for the LIXIL Group as a manufacturer. Serious product defects can cause customer anxiety and greatly affect the reliability and reputation of our products. Greenhouse gas reduction* The adoption of the Paris Agreement to combat climate change by 196 parties has shaped a clear direction towards future decarbonization. Global water shortage is intensifying and we need to do more to protect water, energy and other natural resources throughout the LIXIL Group value chain, from procurement to production, distribution, product use and disposal. Supply chain management* Stakeholder interest in responsible supplier management has grown in line with the development of international standards on sustainable procurement. 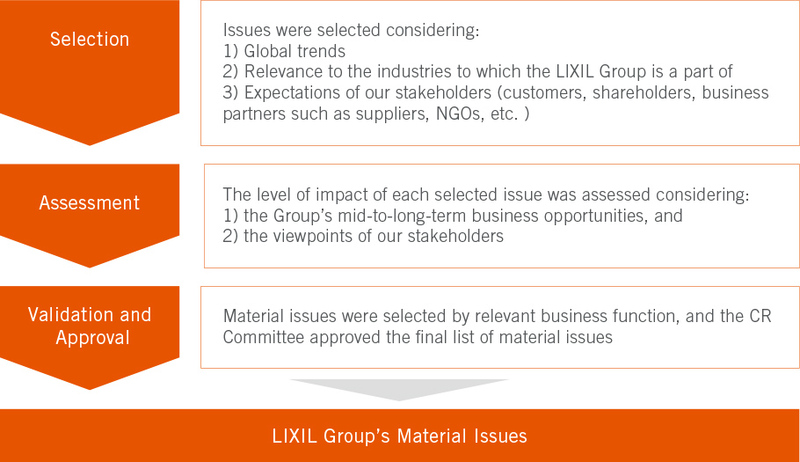 The LIXIL Group's manufacturing footprint expands across Japan, China and the Asia-Pacific, as well as, Europe, North and South America, and the Middle East, and we need to do more to promote responsible supplier management. Stakeholder engagement and collaboration* The UN Sustainable Development Goals have galvanized companies into helping solve social problems. As a comprehensive living technology company, we need to cooperate with stakeholders and focus more on R&D designed to help solve social issues, such as graying society, hygiene and the environment.